My photographic emotions are fickle and changing all of the time. In the Spring and Summer, the time of color and light, I like the big and fast lenses, or sometimes the macro lens, so I can bring my passion for color and light to the wider world. Around November, the time of the gray days, I pick up my monochrome camera and my battered old second hand Zeiss portrait lens, and I fall in love with black and white photography all over again. And that is a good thing, because it will soon be time for the winter pasture, and that is the sacred time of black and white photography. This shot of Maria scratching Liam’s back is a good example of why I love black and white photography. It doesn’t just capture the literal image, but rather the soul of the image. I don’t know exactly how it works, but I think black and white photography is “soul” photography. I think I’ll carry the monochrome around for awhile. Speaking of black and white lenses, I am very happy to have come across a 10-year-old Zeiss 50 mm lens on sale for $600 online. I am trading two of my lenses, a Sigma 85 mm and a Canon 35 mm for the Zeiss. I will only have to pay about $100 for it, a really wonderful exchange. It is a great deal and I can’t wait to use it. It will come in about three weeks. Jon, I love your black and white photos for that reason – they do feel like “soul” photos – the essence of a thing, without the distractions of color. 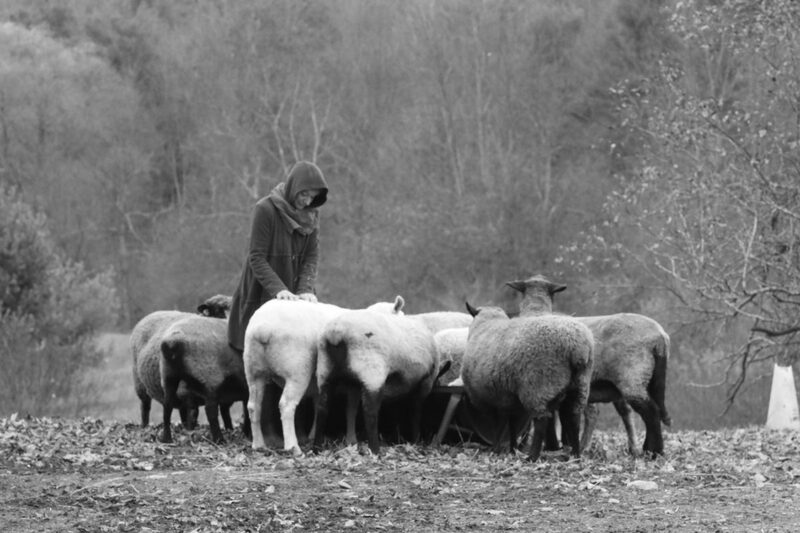 This one is lovely – I can see Maria and her joy at being with the sheep, and the sheep’s total trust in her.